When you need to install a zone expansion module in a tight space, here’s your solution: DMP’s new 711S Zone Expansion Module. This updated version of the 711 is a fraction of the original model’s size, making it ideal for small applications, such as installing in a pull station back-box or in a recessed contact hole behind the contact. 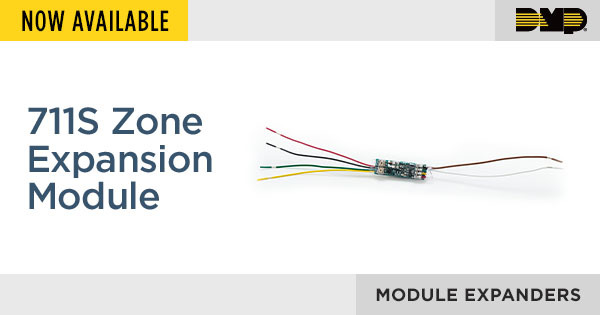 The new 711S is a flying lead style, single-zone, addressable expansion module that allows you to increase the number of reporting zones available on XT30/XT50 and XR150/XR550 panels. The modules connect to the panel four-wire Keypad Bus or LX-Bus™ and are set to an address that determines the reporting zone number. The 711S provides one Type A Class B zone. For more information, please review the Installation Guide. If you have any questions, please contact DMP Inside Sales at 877-757-4367 or at InsideSales@DMP.com.